As an adult I've developed a few odd skin allergies, one of them causes a strong reaction to salt, citrus, and a few other things when they touch my lips. It can manifest itself through redness, swelling, pealing, pain, and/or rashy spots on the lips that can last from a few days to a week or so. The cure? Avoid the things that set it off. Thanks, doctors, I never would have thought of that myself! Unfortunately for me, it appears that as of now no other cures have been found. Over the years I've tried every balm, lip treatment, and whatever else is on the market that I could get my hands on. Some worked for a while, most didn't, to relieve lip chapping, redness, and irritation. I've done a great deal of research to find out what to try and what to avoid, but still, in the long run I hadn't found a treatment I was head over heals for. 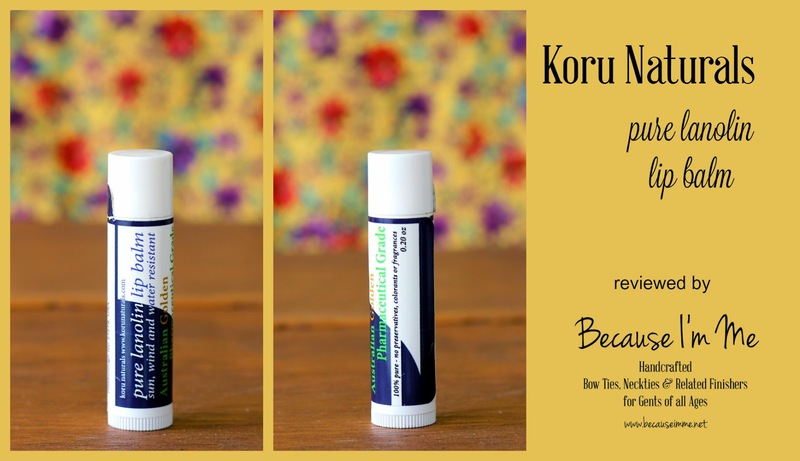 When I was asked to try Koru Naturals Pure Lanolin Lip Balm by Koru Naturals I was more than happy to say yes. This is a good-for-your-lips lanolin based balm and doesn't contain any icky petroleum. The balm contains no colorants, perfumes, or funky additives, all of which are also things that often set of an allergic reaction. The Lanolin Lip Balm isn't waxy like most over the counter products, so the consistency is a little different than most store bought products, not as thick and solid. It feels a little different going on and it's easy to over do it, I found that dabbing it on rather than gliding worked perfectly. Also, it is affected by heat and cold at more minimal temperature changes than most lip balms I've tried. It can get soft when warm but again dabbing it on helps. It gets a little harder when cold, but softens due to body heat very quickly. While trying this product, for the last month, I opted to eat oranges and occasional pretzels so my opinion would be based on "real life" (I love pretzels). I am thrilled to say that since I started using this I haven't had any lip issues. I'm also using it less times a day than the products I was using before. It has no odor or taste and it feels great, not waxy, but more of a light, easy to forget about, coating that leaves a gentle, glossy finish. Honestly, I'm really excited about this lip balm. It's the best product I've found over the last 8-10 years for my lips. 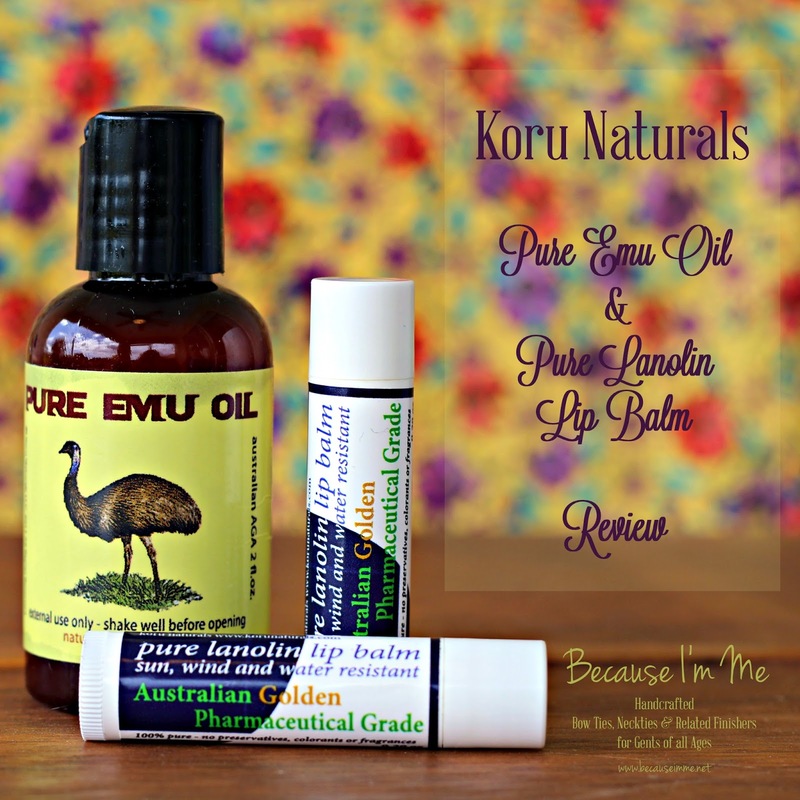 I was also given the Koru Naturals Pure Emu Oil. I'm not the biggest believer in the latest fads to hit the internet, so I was curious, but hesitant, to try this. The Emu Oil is fully refined but not clarified, which can remove some of the good ingredients. It is an oil, but feels very lightweight and is quickly soaked into the skin. When using this I can rub any leftover into my hands and go about my business, not feeling like I have an oil on at all. The Emu Oil has no scent that I can detect but my cats will come from all over the house when the bottle is opened and try to lick it off the carpet when I step after using it on my feet. I focused on three "problem" areas - my ever-increasing facial lines, my dry cracked barefoot Florida girl heels, and my son's very moderate elbow eczema.I also used it in other circumstances, but those were three that got the most attention. After almost a month I do see a noticeable difference in my face. I chose to use the Emu Oil at night, since it it an oil, and just once a day. The wrinkles aren't going away ... I'm not getting younger and reality dictates that I'm going to age, just like everyone else. However, my skin looks healthier and the fine lines are minimized and it feels more hydrated, but not oily, all the time. I've been spending a lot of money for what I call "quick fixes" at the department store, that work when you put the product on but honestly don't have lasting results; the Emu Oil, at a fraction of what I was spending, is providing better and longer lasting results. My heels ... they are not "healed" but the deep cracks are gone and I believe that with continued use they'll continue to improve. I've used the oil twice a day, rubbing two-three drops into each heel. Again, I didn't change my behavior at all, still walking barefoot at the beach and at home. This oil is very light and doesn't feel oily after putting it on so I had no problem walking around immediately or going to sleep. I've used other products that made me feel like I'd dipped my feet in a vat of olive oil, this is completely different, and feels worlds better! River's eczema ... I first noticed he had little dry, bumpy patches a few months ago. I rubbed hand lotion on the irritated area but it didn't do much for them. I also tried saltwater, commonly referred to as going to the beach, but that didn't cure it either (worry not, that's not stopping us from going to the beach a lot). He was as happy as I was to try the Emu Oil. I applied a few drops of the oil to each elbow twice a day. Within just a few days his elbows were 90% cleared up and have stayed that way as long as I continue using the product on them on a regular basis. I wish I had before and after pictures, but I didn't realize how well and fast it would work! Oh, another good use for the oil: One day we went kayaking all day long and I forgot to put sunscreen on my face. I put it on my arms, but not my face because I'm smart like that. After I got home and realized my face had the coloring of a ripe tomato I put the Emu Oil along with some Aloe Vera gel on the sunburn a few times and it cleared up within 24 hours with no peeling. Woo hoo. I'm very happy with both products and fully intend to keep using them. I've actually spent some time trying to figure out what I'll do if the company retires before I die and I can't get the lip balm, which is silly but when you find something good you want to keep it around. The lip balm and emu oil are so reasonably priced that I'm actually saving money by using them instead of my beloved, expensive department store brand, which runs $35 for a .5 oz. container of wrinkle reducing eye cream and less-than-beloved but acceptable standard lip balm. The Koru Naturals Pure Lanolin Lip Balm is available for $9.80 for four standard size tubes and the Koru Naturals Pure Emu Oil is $9.85 for a 2 oz. bottle and $18.20 for a 4 oz. bottle. Koru Naturals does offer some specials, like 2 4 oz. bottles of Emu Oil, a free Emu Oil Lip Therapy Lip Balm, and free shipping for $35.80. 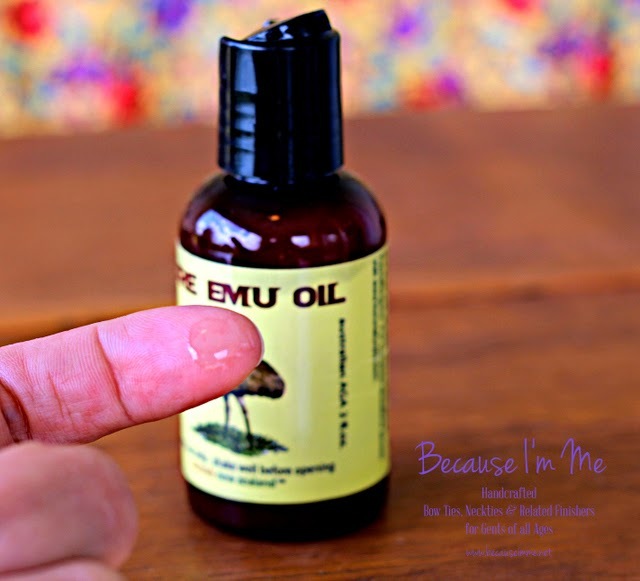 What is emu oil? Is it .... oil from the bird? I hadn't heard about this before. Yup, oil from the bird. LOL Which, I think, is why the cats like it so much. Lip color, I'm so jealous! Thanks for your comment. I haven't tried emu oil, but I definitely want to soon. The lip balm looks great for dry, chapped lips too. LOVE this. Thank you for sharing. I haven't tried Emu oil yet, but would love to use it as a carrier oil and in some of my herbal salves and products. My son has eczema and that Emu oil sounds great. I'm always looking for more natural remedies for him!